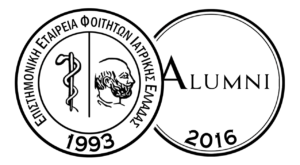 The Alumni of the Scientific Society of Hellenic Medical Students (SSHMS) was founded on the 14th of May 2016. It consists of past members of the SSHMS and has as a goal to preserve the relationships between them and the active medical students team of the SSHMS. The members of the Alumni, before its birth, were already on close contact with the successors of the SSHMS, and have been providing their organizing and medical knowledge and expertise in ongoing national projects of the society such as the Essential Skills in the Management of Surgical Cases (ESMSC) and the Applied Basic Clinical Seminar with Scenarios for Students (ABCS3), all of which begun during our student years. All of us who were members of the SSHMS and lived through its difficult and beautiful moments, we feel the need and the responsibility to maintain this experience and transmit it to the new generation who are now in the driver’s seat. Furthermore, we still feel members of this great family, still living special moments, working and building up strong character together and making friendships from all around Greece and abroad through an abundance of a projects and meetings. The Alumni of SSHMS through projects, lectures and meetings has the ambition to be the instrument that will guarantee this initiative through the most creative way.